How much do you actually know about the reasons behind conducting risk assessments in your catering business? You may already know that conducting risk assessments in the workplace is a legal requirement that no proper catering business entity would dare to violate. But aside from that, conducting risk assessments in any workplace, regardless if it’s a high-risk job or not, enables the minimization of all the possible health risks that may occur and maintains a safe and healthy environment. By having and conducting a proper risk assessment, you will be able to uncover all the possible risks that might possibly occur in your catering business. However, do not just conduct any kind of assessment—you need to be guided by a proper one. Lucky for you because in this article, we have prepared different examples and templates of risk assessments that are specifically made for catering businesses. These examples and templates can be edited using various editing software applications under Adobe Creative Cloud and Microsoft Office Suite that are definitely user-friendly. Doing risk assessment means you evaluate what are the possible instances in your catering business that will put itself and the catering staff members to harm. Along with that are identifying the steps on how to prevent whatever possible harm that may come. Once you will be able to identify all the possible risks, you will have the capability of identifying the specific systems that will help you in controlling the risks and even in avoiding all the possible risks. At first, you might think that conducting catering risk assessments is a hassle but in reality, it actually provides a lot of benefits. Among these benefits include recognizing and controlling all the possible hazards in your workplace, creating awareness among your staff, setting standards of managing risks, reducing hazardous incidents in the workplace, and raising the standards of your health and safety measures. And you can do all of that by just conducting a risk assessment. 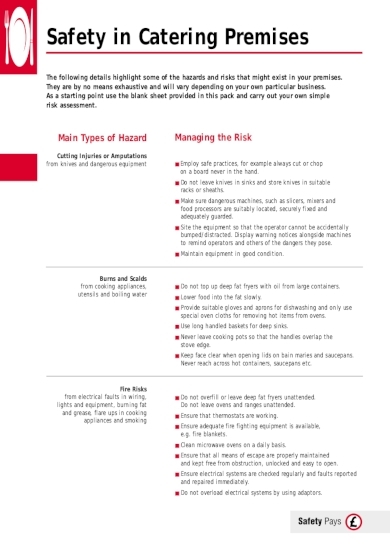 And if you want to do the same thing for your business, consider checking out this risk assessment example above and see for yourself the benefits you can get by conducting on to your own catering business. Many people assume that unfortunate incidents in the workplace happen due to the negligence made by the employees or staff members. However, the reality is that these incidents happen because of poor management controls. By conducting a risk assessment alone, you will already exert a proactive effort to control all the risks that might occur and that includes the majority of unfortunate incidents that may possibly occur in your catering business. As mentioned, a lot of people assume that conducting assessments are a hassle and even an inconvenience to some, but conducting one is actually way better than having an incident while you provide catering services to events. By conducting effective risk assessments, you will be able to create systems that will reduce the likelihood of any incidents that will put everyone’s health and safety at risk. Such systems include proper training, regular inspections, clear work procedures, enforced employee fitness, regular maintenance of catering equipment, and the best of all, sufficient supervision. 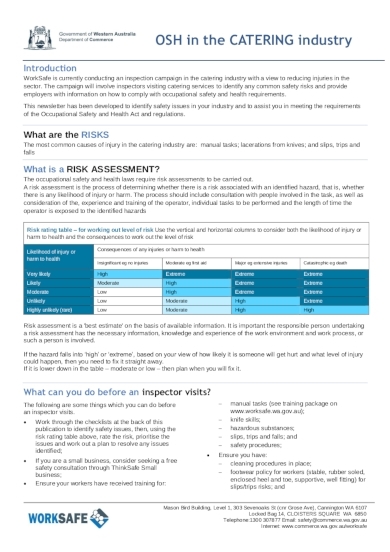 All of these systems would effectively manage the health and safety risks in your workplace and to keep you guided as you conduct such assessment, you may download the given example above that contains relevant inputs on how you can properly assess your workplace situation. As an employer, it is your responsibility to spearhead in managing the health and safety risks of your catering business. This is why conducting a risk assessment is important especially that your services involve food and drinks because once your clients had already consumed it all and that you were not able to assess the possible risk, it would be such a disaster. 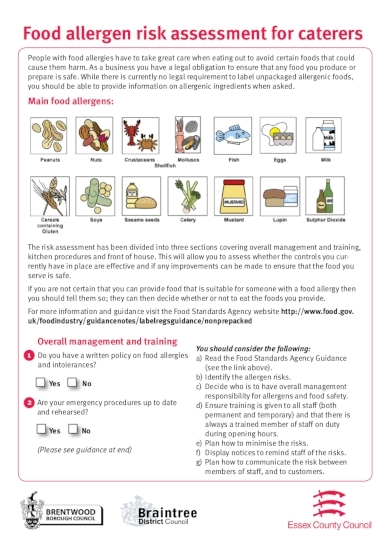 One of the things you should consider when conducting a risk assessment is by assessing whether the dishes you serve contains food allergens or not. If you fail to fulfill this obligation, it will be harder for you to gain clients the next time around if they will learn about your failure in upholding your obligations. There is also the disadvantage of expensive legal and social costs as a result of your unsafe working conditions. Before starting any business, you must already consider risk assessment as an important step that will help you in protecting the safety and welfare of your catering staff and, of course, your catering business. By doing so, you are also complying what the law states and you are also protecting the safety and welfare of your clients who will be the ones availing your services. Once this is already programmed into your mind, it is now easier for you to focus on the possible risks that will most likely happen in your workplace. 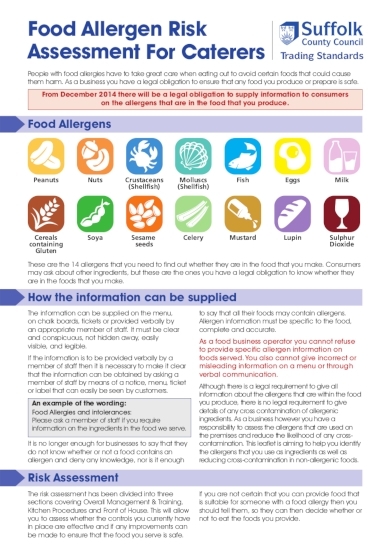 You can now easily identify all the potential things that will cause actual harm particularly on what food and drinks you will be catering to your guests. For you to be able to conduct an effective and successful risk assessment, we suggest that you should consider the use of the catering risk assessment examples and templates provided in this article. You can also begin by defining a scope of work. Perhaps you want to improve the health and safety conditions in your catering business’s kitchen or you want to uncover the possible areas of risks on how you handle your catering services. 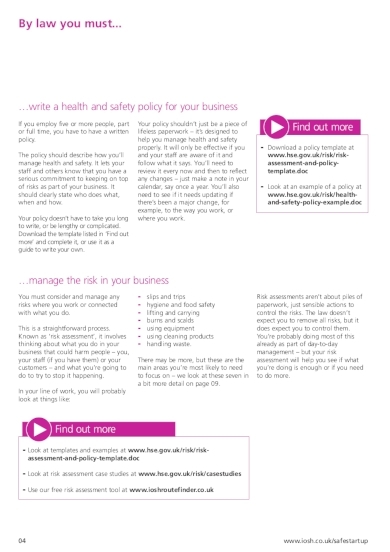 Whatever your objectives might be, we hope that the risk assessment examples and templates found in this article have been helpful for you and your catering business.